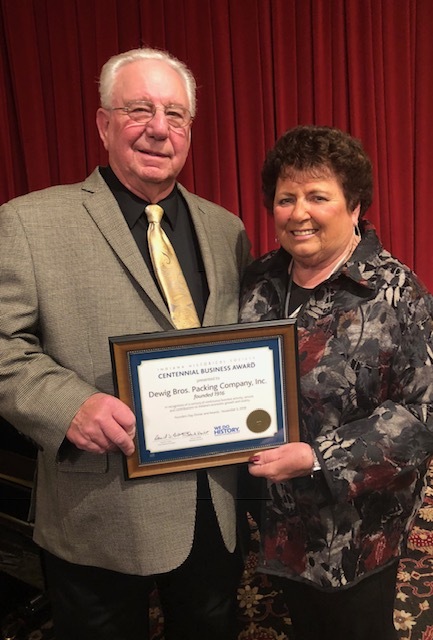 Dewig Meats received 2018 Centennial Business Award on November 5, 2018. from the Indiana Historical Society. The Indiana Historical Society (IHS) is honoring a Haubstadt business for its long history of service. IHS has awarded Dewig Bros. Packing Company, Inc. with a 2018 Centennial Business Award. The award, which aims to provide special recognition to Indiana companies in business, is part of the Historic Business Register founded in 1992 by trustees and members of IHS. Dewig Bros. Packing Co was founded in 1916 and has been family owned and operated since its inception. After years of planning and preparation, Dewig Bros. Packing Co. completed a total remodeling of its retail operation in 2011. Expanded product, expanded hours and expanded service have created one of the most vibrant meat markets in the nation. Click here for more information about IHS’s Centennial Business Awards or the Founders Day event.